← THE YANKS ARE COMING! 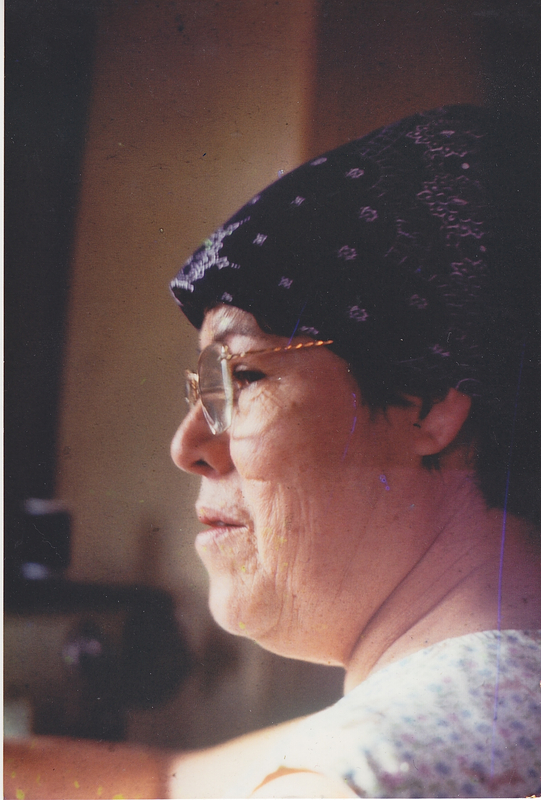 It’s mother’s day again, and of course it makes me think about my mother. She died in the summer of 1977; it will be 38 years this July. I think of her often, not only on Mother’s day. But sometimes a day or two will go by and I don’t think of her, at least actively. But she is always there, etched in my mind, looking forever 53. 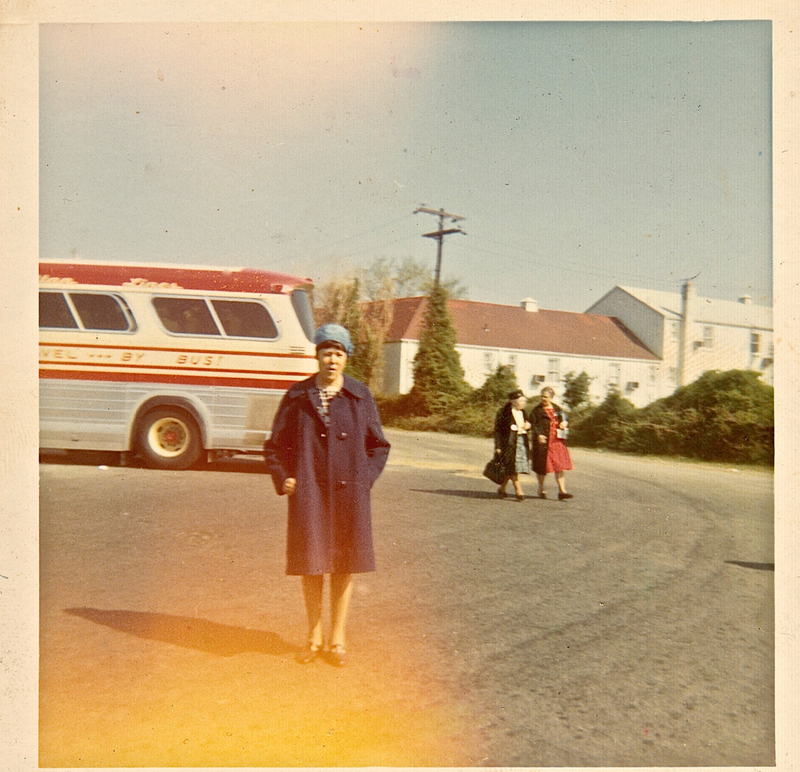 On a church trip in the late ’60s. My mother was a serious woman; she seldom smiled. There wasn’t a lot to smile about for a woman for a poor immigrant woman with three kids of her own and a foster child to care for, not to mention her grown baby, my father. He was an alcoholic, and if you know one, you understand what I am talking about. Money was tight, she never tired of reminding me of that; but she did nothing to dissuade me of my dreams of being an artist. “Make sure you can pay the rent, and learn how to take care of yourself. I won’t be around forever, you know.” I never realized how prophetic those words would be, and how right she was. I was the eldest at 23 when she died, so I had a little bit of a head start at taking care of myself. I was living with a girlfriend not far from my boyhood home at the time, and visited often. Mostly to use her washing machine and cadge a free meal. My girlfriend wasn’t such a hot cook. The last time I spoke to her she complained that I hadn’t called for a few days, and was I coming over Sunday for dinner. There was a soft, pleading tone in her voice. Mom was an expert at making me feel guilty. But she didn’t make me feel guilty enough, I blew off the dinner invitation and was even annoyed that she’d called me at work to ask. She had to call me at work, our home phone was disconnected. So I was in total shock when the following week, I don’t remember the day, but it wasn’t Monday; my brother knocked at my door in the early evening. “Mom died.” He said standing in my doorway. 23 year olds, or for that matter 17 year olds like my brother are not prepared to hear their mother has died. It’s like the end of the world for a child, and believe me, we were children in 1977. But my world did not end; it just took some rather nasty turns for a period of time. But all of that was my doing, not my mother’s. My mother babysitting. 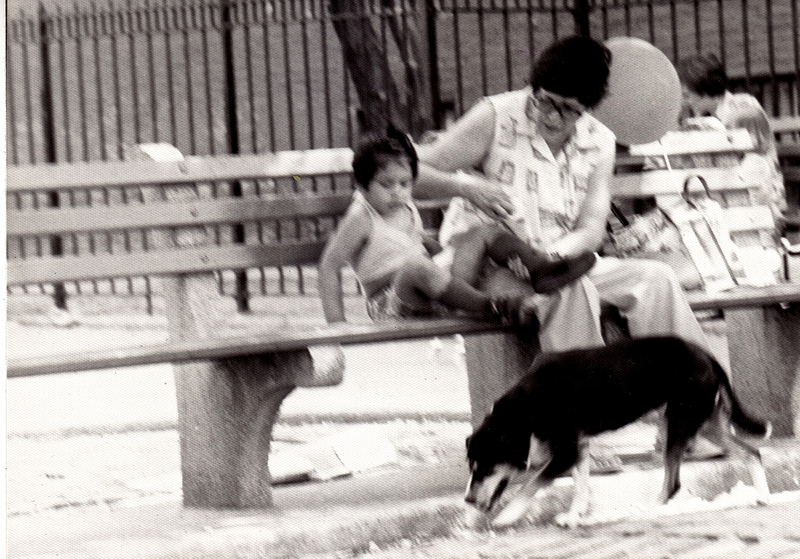 I think the dog got whatever the little girl dropped. She taught me right and wrong, I’m grateful for that. She taught me thrift, how to sew, how to fold sheets. She tried to teach me to be kind to my siblings, which took a while to learn. But she tried. She taught me to love music, dancing, and reading. She told me not to physically hurt women the way my dad did. She taught me how to love, however sparingly. So besides the photograph, and I have several, actually, I have all that. All the stuff she taught me and said to me, good and bad. Things I’ll never forget. The voice frozen at the age of 53 asking me to come to dinner. It’s a good thing to have. This entry was posted in Uncategorized and tagged acceptance, beauty, death, kindness, loss, Love, Mama, Mother's day, wisdom. Bookmark the permalink. Thanks for this very moving piece – I especially loved hearing what she taught you. Thanks for this very moving piece- I especially loved the part about what your mother taught you.